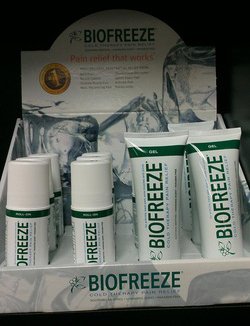 Biofreeze is a topical ointment that comes in gel or roll-on that provides fast penetrating relief from back pain, muscle spasms, shoulder and arm discomfort, sports injury pain, arthritis pain or painful joints. It is pain relief that works! Questions? Call Dr. Khristi Otto today (920) 731-0715.